All registration forms are due to your church office by April 8. Saturday, April 21, 2018 from 9:00 a.m. to 1:30 p.m.
Children and Youth Ministry, featuring pastor and author, Traci Smith. Traci helps families and congregations nurture healthy faith development from cradle to grave. She is the author of Faithful Families: Creating Sacred Moments at Home (Chalice Press: 2017) which teaches parents (and the ministry leaders who work with them) how to weave tradition, ceremony, and spiritual practice throughout everyday life. Traci writes, speaks, and consults on many topics including intergenerational ministry, stages of faith, worship accommodations for children and youth, and ministry team development. Visit her online home at www.traci-smith.com to find resources related to these topics. Traci also sends out a weekly email, Treasure Box Tuesday, that contains weekly resources and fun links. congregations to create Holy Places, we need to cast off our belief that churches have to have a large single-use facility. We embrace and support congregations that think creatively!” With 35 years in the civil engineering and land surveying fields with a background in facilities and construction management, Jim is well equipped to help churches assess the condition and viability of their facilities and to assist them in developing long range plans for the design and use of their buildings for ministry and mission. Read more about Jim and Disciples Church Extension Fund at www.disciplescef.org. Evangelism, featuring founding pastor of Mission Gathering in San Diego, Rich McCullen. After years spent as the leader of a non-denominational student ministry, and later working to help youth connect with local church, Rich and his team sought out a larger home for their growing movement. They sought to connect with a tribe larger than their own experiences and eventually landed at Torrey Pines Christian Church (Disciples of Christ). Out of this time Missiongathering grew in San Diego’s Urban core to be one of the leading forces for change in the city. Missiongathering is “a diverse, inclusive, and innovative Christian Church (Disciples of Christ) committed to empowering you to live a vibrant and whole live.” Read more about Rich and Missiongathering at www.missiongatheringsd.org/mgm.html. 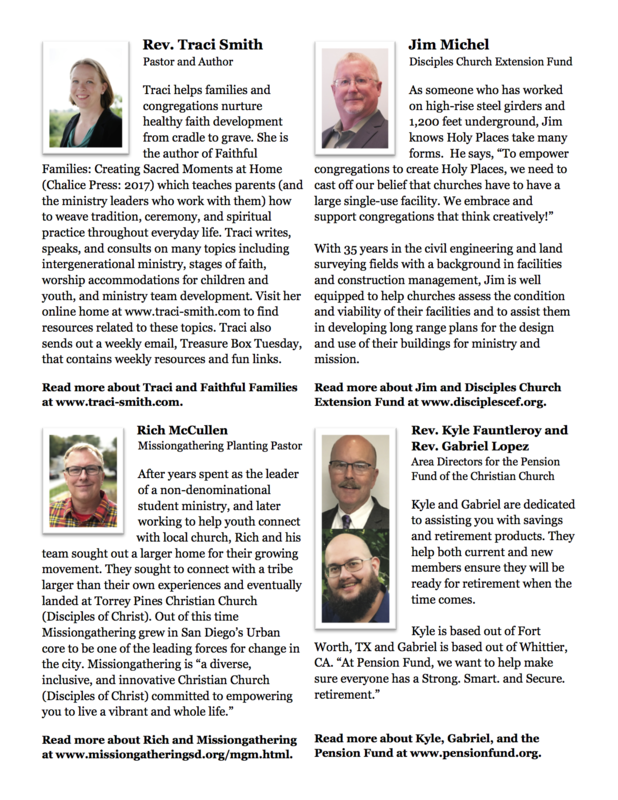 Church Finance, featuring Pension Fund Area Directors, Kyle Fauntleroy and Gabriel Lopez. Kyle and Gabriel are dedicated to assisting you with savings and retirement products. They help both current and new members ensure they will be ready for retirement when the time comes. Kyle is based out of Fort Worth, TX and Gabriel is based out of Whittier, CA. “At Pension Fund, we want to help make sure everyone has a Strong. Smart. and Secure. retirement.” Read more about Kyle, Gabriel, and the Pension Fund at www.pensionfund.org. This is the second part of “Wells of Generosity” sponsored by our Congregational Vitality Team; it is not necessary for you to have participated in part one, from September 2017, to participate in this event. Disciples Church Extension Fund is a general ministry of the Christian Church (Disciples of Christ) in the United States and Canada. The Pension Fund of the Christian Church is a ministry serving employees of the Stone-Campbell and Restoration Movements across the globe. This event is sponsored by Arizona’s Congregational Vitality team. In response to a 2016 survey of congregational leaders. Through events like these, teams like our Congregational Vitality Team are enabled to do effective and relevant ministry in Arizona through your support and generosity to the Annual Fund and Disciples Mission Fund. Thank you for your continued support and generosity! Event sponsored by our region’s Congregational Vitality Team.